Not enough can be said about Revolver in Pool A. It’s easy to get excited about the drama that comes with upsets and exciting prequarter match ups but floating above it all is the ever-present dominating presence of Revolver. At this point, Revolver has had the most consistent performance not only of this tournament, but of this season. They continued that consistent performance with an undefeated day Thursday. The remainder of the pool went to seed with the only notably close game being between PoNY and Florida United in the first round. Revolver established itself early with a 7-5 lead but Truck Stop refused to go quietly, closing the gap to one at 11-12. That would be as close as Truck would get as Revolver went back to its bread and butter, putting the disc to Beau Kittredge in open space and scoring the next four points to win 15-11. Elsewhere, Florida United, in the team’s first trip to Nationals, made its presence known by taking PoNY to double-game point. United went up early and slowly but surely gave its lead back. United moved its strategy personnel-wise going into Nationals and began playing in pods as opposed to lines and kept things wide open throughout the game. This strategy meant that FU was extremely happy with its performance all the way up until a throwaway on double-game point gave away United’s chance at breaking for the win. Though it was a heartbreaking loss for United, who had the chance to win, captain Alton Gaines kept things in perspective for his team after the game. After a tough game against PoNY, Florida United just didn’t have the strength to play tight with perennial powerhouse Revolver. San Francisco took a 6-2 lead before either team could really blink and from there it was a coast for both teams with United saving legs for a more winnable game and Revolver maintaining a high-level of play in anticipation of its 1v2 match up in the next round. Elsewhere, Truck Stop and PoNY were fighting hard to hopefully earn a more favorable prequarters game against the 3-seed from Pool D.
Truck Stop gave up an early lead to PoNY 6-4 but managed to claw back into the game and close the gap to an 8-9 deficit. Unfortunately for Truck, it would fall victim to a similar fate as Florida United. PoNY’s offense continued to grind in a way that made it difficult for Washington to get back into the game. When it was all said and done, New York took home a 13-10 victory in a chippy, shortened game. Revolver again took care of business in its final round of the game; perhaps PoNY’s tweet says it all about the game. Revolver cruised to an 8-5 lead at halftime and had no trouble getting the 15-11 victory. 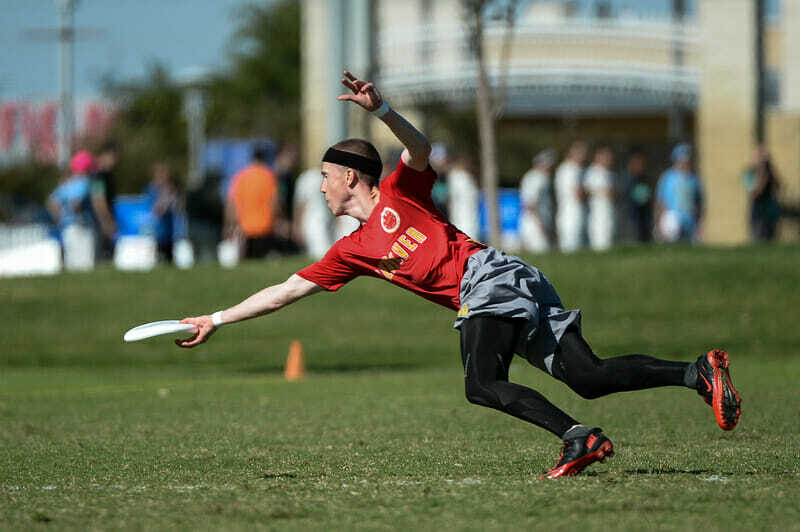 Florida United again faced the same story as it gave up just one break to halftime for an 8-6 score in Truck Stop’s favor and then promptly broke to narrow the score to 8-7. However, that was as close as FU would get as Truck slowly pulled away and finished with a 14-9 victory. Comments on "Pool A Recap: Men’s Division"